Who Really Matters (Amazon, Goodreads, Powells) by Art Kleiner is one of those books I wish I’d read much earlier in my career. Had I learned the aspect of organizational power dynamics the book explores I could have saved myself a lot of frustration and instead used that energy to better develop my career. But that’s also why I’m excited to share this overview with you. If the overview presented in this and subsequent posts clicks with you, I highly recommend picking up a copy for yourself, especially for the useful diagnostic exercises at the end of most chapters. 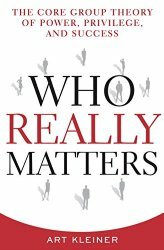 Who Really Matters puts forth the theory that central to every organization is a Core Group of people who really matter. Members of the Core Group are the ones who enjoy the most power, privilege and success in their organization. It revolves around their perceived needs, wants and priorities. The membership of this Core Group isn’t written down anywhere and who comprises a organizations Core Group varies from organization to organization. Kleiner stresses that there’s nothing inherently bad about organizations revolving around Core Groups, but that we can better serve ourselves and our organizations if we increase our awareness about Core Groups and how they operate. Part 1: The Reality of Organizations introduces Core Group theory and includes just enough organizational science for us to have a context to understand the theory. Part 2: Leading the Core Group presents ways Core Groups can be great as well as common challenges that make Core Groups and their organizations less effective. Part 3: Essential Core Group Career Guide offers ways to build a fulfilling, productive career by developing your own inner core group, avoiding behaviors that enable dysfunctional Core Groups, and building equity so you’ll be brought into a Core Group. Part 4: Core Group Stories explores what parasitic Core Groups look like, how feuding Core Groups affect organizations and then presents cases studies of Core Groups in different settings such as government agencies, labor unions, management consultancies, and schools. Part 5: Making a Better World explores how to apply knowledge of Core Group theory toward improving your own organizations with shadow core groups,’ how we might approach corporate governance, and how organizations interact with each other in society at large. Read the next post covering Chapter 1: The Customer Comes Eighth and Chapter 2: How Organizations Really Think.